Your best Internet marketing tool, regardless of whether you have a Facebook page or any other social media presence, is your insurance agency website. I’ve written several posts about how to get the most out of your website by creating selling opportunities and building relationships. Today I want to discuss the presentational aspect of your website. I will define the basic building blocks of an insurance agency website and explain how to make it attractive and convey a professional image to viewers. It should be clean and simple, easy to read, easy to look at. No blinking pictures or images that move. Avoid flashy graphics and multimedia effects. For one thing, they can take a long time to download, and if it’s important content that people need to see, they may get impatient and leave your site prematurely. Almost as bad are websites with an embedded sound video where suddenly, a young man or woman pops into the screen, like a person in a hologram, to talk about what a great agency the viewer was just trying to read about before being interrupted. The truth is most people find this kind of thing annoying. Stick with text and background colors that are easy to see. Pick colors that contrast well, primarily dark text against light backgrounds, such as dark blue against light yellow. But there’s nothing wrong with black against a white background. Let the colors in your images, borders and other elements such as your navigation bar and banners spice up the look of your site. Use font sizes of at least 12 pixels. Web designers measure with pixels, not with points as print designers do. Twelve pixels roughly equal 9 points. If you think about the font sizes you use in your Word documents, 9 points is just about the minimum size that’s readable. So you want font sizes of at least 12 pixels. Stay away from fonts like Algerian and Broadway, which even used sparingly are much too ostentatious. Use conventional fonts such as Arial, Georgia, Palatino, Tahoma, Times, Trebuchet, Verdana. There are Mac and Windows versions of all these fonts. 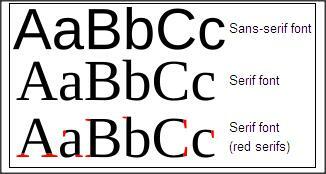 All fonts are classified as either serif, like Times, or sans serif, like Arial. Serif fonts have serifs or “tails” at the ends of letters, while sans serif fonts do not. In print, the tails or strokes attached to serif letters aid the eye and allow the reader to process text more quickly and easily, according to studies. On the web, though, where screen resolution is not as good as in print, serif font details can appear blurred and actually hinder reading if the font size is not large enough. The general rule for print fonts — sans-serif for headlines and serif for body copy — is opposite for the web. In fact, many web designers prefer serif fonts exclusively, for an overall cleaner website appearance. Most of the fonts we use for both SmartsPro Marketing’s websites (the new name for Smart’s Publishing beginning in 2012) and our insurance agency websites are sans serif (Verdana, Helvetica, Arial). Next time I’ll discuss how to make the architecture of your website consistent, coherent and professional — and to allow for easy, do-it-yourself updates.